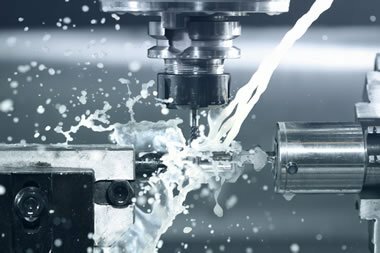 Metalworking fluids are commonly used within industrial machining and grinding operations and are usually water based fluids or neat oils. Metalworking fluids (MWF’s), often also be referred to as soap, slurry, coolants or suds are used to provide cooling and lubrication to metals during cutting, engineering and fabrication processes. The use of such fluids brings with it a number of health risks including contamination by Legionella bacteria, the organism that causes the potentially fatal Legionnaires’ disease. What are the health risks of using cutting fluids? Dermatitis and other forms of skin irritation. Bronchitis, asthma and other serious lung diseases such as EEA (extrinsic allergic alveolitis). One of the lesser known but potentially very serious health risks associated with working with water based metalworking fluids is Legionnaires’ disease. Caused by Legionella bacteria, Legionnaires’ disease is a serious lung infection that can in some instances prove to be fatal. Initial symptoms include fever, chills and muscle pain. Once infection reaches the lungs then chest pains, a bad cough and breathing difficulties can result. Legionella bacteria is commonly found in utility water supplies at very low concentrations which do not normally pose a risk to human health in such small numbers. However, if the water temperature and available nutrients in the water are at the right levels, Legionella bacteria can grow and multiply rapidly. As water based metalworking fluids are made mostly from water, their use during engineering activities may produce water aerosols. If that water is contaminated with Legionella bacteria, it can result in operators or those within the working environment being exposed to the bacterium and at risk of contracting Legionnaires’ disease. However, if the systems are properly managed, the potential for legionella contamination of the metal working fluids and the health risks that this may create can be controlled. Health & Safety Executive: Approved Code of Practice (ACOP) L8 “Legionnaires’ disease. The control of legionella bacteria in water systems”. Health & Safety Executive: HSG274 Legionnaires’ disease: Technical guidance Part 3: The control of legionella bacteria in other risk systems. The storage of and distribution systems of MWF in lathe and machine tool coolant systems should be cleaned thoroughly and disinfected on a regular basis, six months or more frequently if it is recommended by the manufacturer of the machine or the suppliers of the fluid. Health & Safety Executive: COSHH Essentials: Managing sumps and bacterial contamination. Sumps should be covered and kept free from dirt, food etc. Check biocide concentration according to to recommended levels. Keep records of dip slide tests and pH tests. Health & Safety Executive: Managing Bacterial Contamination in Metalworking Fluids. It also recommends like the COSHH Essentials sheet that dip slide tests should be taken. A dip slide is a plastic carrier that is coated with a sterile culture medium which is then dipped into the liquid that is to be tested and then incubated giving any bacteria time to grow. The resulting colonies of bacteria that grow are compared to a reference chart which will help identify the level of bacterial contamination. > 106 CFU/ml Poor control. Immediate action to be taken. 103 to <106 CFU/ml Reasonable control. A review of control measures should be undertaken to make sure levels of bacteria remain under tight control. The risk assessment should then spell out what specific action should be undertaken. <103 CFU/ml Good control. Bacteria are being maintained at low levels. No further action is required. Health & Safety Executive: COSHH essentials for machining with metalworking fluids. As experts in the risk management of Legionnaires’ disease, legionella and other water-borne pathogens, we can help devise comprehensive risk management programmes dealing with water safety issues in industrial, commercial, healthcare and institutional facilities. Our services include risk assessments, legionella testing and more.